... Crew Boat Superstructure arrangement enables easy access to engine room during maintenance. This ergonomic arrangement of the vessel will give maximum comfort during utilization and satisfaction for passengers and the crew. A special vessel is designed with a particular, highly-specialized task in mind. NauticExpo offers craft specialized in ice breaking, cable laying, boring, various types of dredging, lightering and other operations. Each vessel is designed for a specific activity. 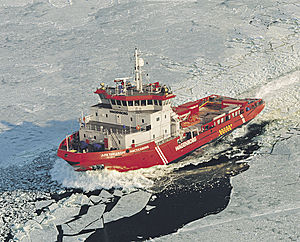 Icebreakers are designed to sail in ice-clogged waters and cable layers deploy and repair submarine cables. Training ships are used to train officers and seamen, while patrol boats carry out surveillance. Dredgers modify the seabed and lighters effect a multitude of transport tasks. These vessels vary in design and technology, depending on intended function. Choice will depend on the intended use of the vessel.